They are found along the Pacific coast of North America from Alaska south through Canada to California. Though disappearing around the world, they are also found in South America, Scandinavia, New Zealand, Ireland, and Scotland. When you think of a rainforest, do you picture monkeys, parrots, and huge, coiled snakes? Not all rainforests are tropical. The temperate rainforests on the west coast of North America are very different from the tropical rainforests of South America. Temperate rainforests have a long growing season, though unlike tropical rainforest, they do have a change of seasons. Temperatures change from 80°F in summer down to near freezing in winter. The cooler temperatures mean that temperate rainforests have less diversity than tropical rain forests. (This means that there are fewer types of animals and plants found there.) This doesn’t mean though that things don’t grow there. These are among the most productive forests in the world. 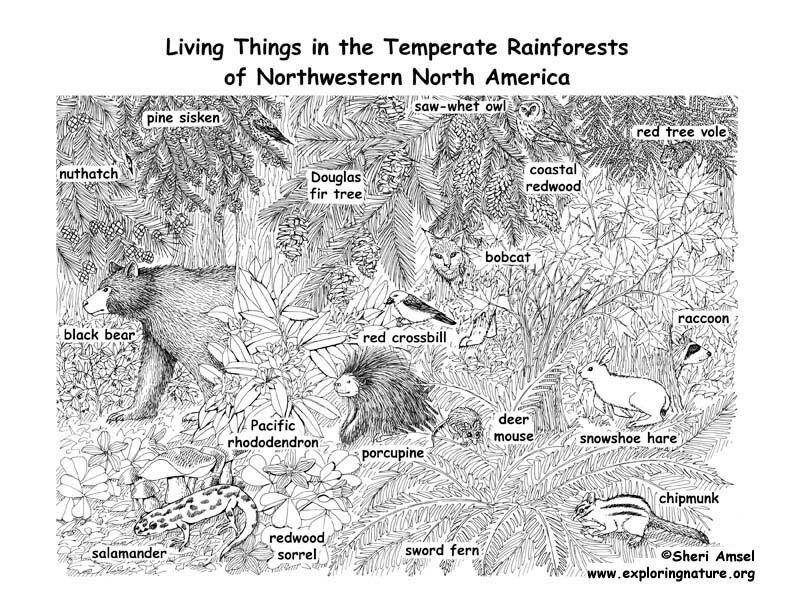 Temperate rainforests have lots of rainfall (sometimes up to 200 inches a year!) but also have cool, moist air in the form of ocean fog keeping things wet. Temperate rainforests have fertile soil. This is a result of all the dead materials rotting into the soil. Decomposing matter releases nutrients back into the soil and is good for growing thick stands of fast growing trees. Trees grow tall here – sometimes over 250 feet and their trunks can reach 15 feet across. Some of these trees can live for 500 years! Because of this, the temperate rainforests have been heavily timbered (trees are cut for lumber products). Unlike tropical rainforests where much of the animal life lives up in the trees, (some never coming to the forest floor at all), in the temperate rainforest, most animals live on or near the ground. Crossbills use their scissor-like beak to pry seeds from cones, while mule deer and red tree vole feed on young conifer needles. Porcupines and snowshoe hare feed on conifer bark in winter while black bears stuff themselves with berries in the fall. In addition to seeds, deer mice and Townsend’s chipmunk eat mushrooms that grow well in the wet environment. Other animals found in temperate rainforests include; raccoon, bobcat, mountain lion, mountain beaver, mink, Pacific giant salamander, shrews, pine sisken, and great horned owls. 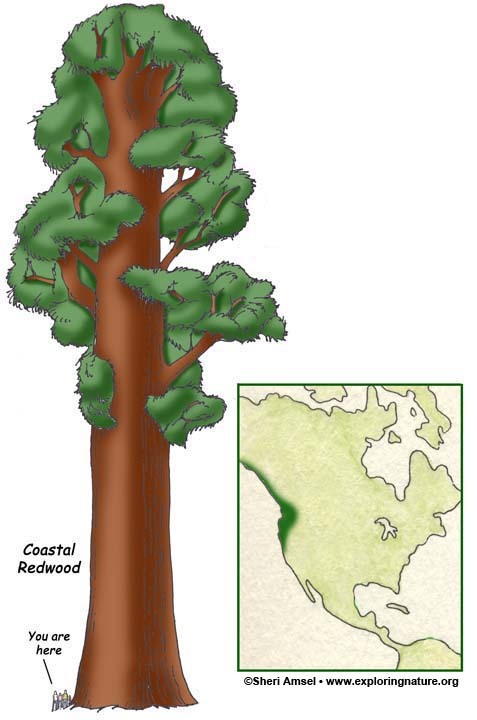 Most of the trees in the temperate rainforests of the Pacific Northwest are conifers. The dominant tree is the Douglas fir. It is one of the tallest trees and is considered one of the most important trees to the timber industry. Further south where heavy rains give way to ocean fogs, the great redwoods grow. Other trees that grow in these forests include western hemlock, Sitka spruce, western red cedar, noble fir, and Pacific silver fir. Smaller trees include big leaf maple, dogwood, and vine maple. The forests are shady and damp and shade-loving underbrush thrives here, including Pacific rhododendron, blackberries, salmonberries and thimbleberries, sword ferns, devil’s-club, redwood sorrel, mushrooms, moss and lichens.